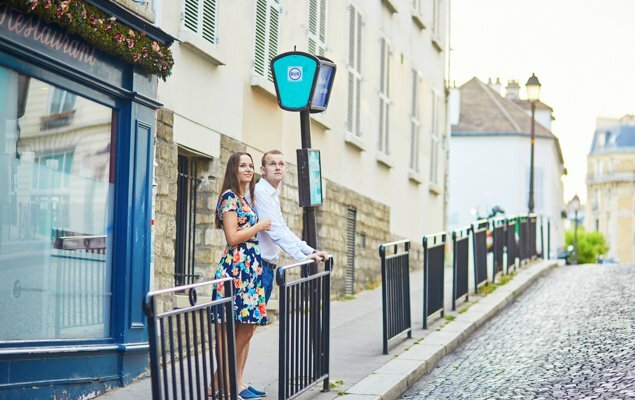 Since there was so much positive feedback on our previous bus articles, the #42 bus line and the #69 bus line, we’ve decided to continue exploring and sharing our favorite places in Paris by taking you on a journey along the #87 bus. The public buses of Paris are some of our favorite modes of transport and offer advantages that the Metro lacks, the most important being the beautiful views as you watch the magical and iconic sights of Paris unfold before you! The #87 bus line could be called the Shopping & Food Lovers’ line, but there are enough historical sites, museums and churches to keep everyone in your party entertained for days. The #87 bus operates Monday – Saturday until approximately 10:00 pm, and does not operate on Sunday or holidays. Which is just as well, since many of the shops mentioned here will be closed on Sundays anyway. We highly recommend you download the App called CityMapper, Paris edition, for your smart phone and become familiar with it before you leave. Available for iOS and Android. There is also a CityMapper web version. This feature-rich app is the best transit app we have found, and we’ve tried many. You may also want to ensure you have unlimited data usage since these apps can eat through a lot of data. We recommend you rent a mobile wi-fi hot spot from Travel Wi-Fi which allows you unlimited data for up to 10 devices for the incredible price of just 8€ per day. You will then be set to truly travel like a local! Alternatively, you can download a map, with or without detailed street names, of the bus system from RATP, or simply find a paper version inside at any metro or train station’s information window. All addresses and hours of operation are current as of this writing, but are subject to change without notice, so always check your app or RATP for the most current information. Click here for a map of the 87 bus you can download. 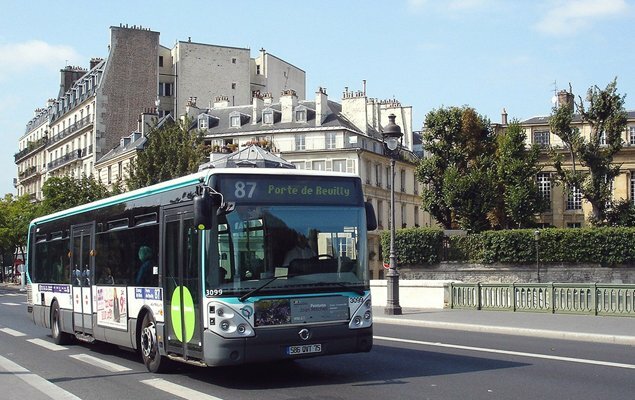 The #87 bus begins in the 7th arrondissement from the Champ de Mars/Eiffel Tower and runs in a general east-west route, cutting through the heart of Saint-Germain-des-Près and the Latin Quarter, crossing the Seine at the tip of Ile St. Louis, continuing on to Bastille and Gare du Lyon, then out to Gare de Bercy, finally ending at the Porte du Reuilly, near the southeastern edge of the city at the Périphérique. We’ll be focusing on the portion from the Eiffel Tower to the Bastille and back! 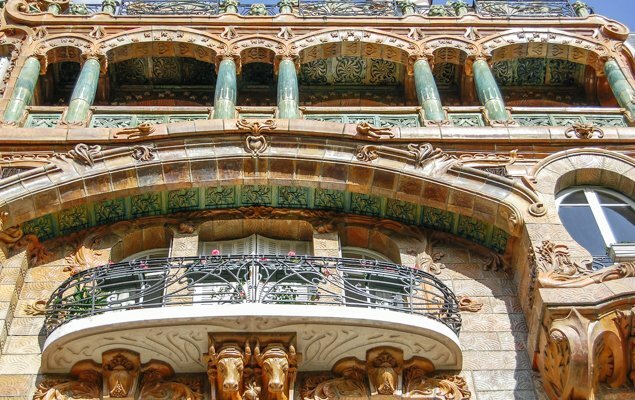 Before you board the bus, make sure to see the Art Nouveau masterpiece at 22 Avenue Rapp, then make your way over to the busy intersection of four roads: Avenue Rapp, Avenue de la Bourdonnais, Rue St. Dominique and Avenue Joseph Bouvard. We think you’ll agree this bus stop has one of the best views of the Eiffel Tower! Board the 87 here. Be sure to board the 87 that shows: Direction – Porte de Reuilly at the top of the bus. We’ve already covered Rue St. Dominique in our blog post about the #69 bus line, so we’ll continue on to the next stops. The second stop is École Militaire and here you will find the impressive French military academy, a vast collection of buildings, training facilities and barracks which opened in 1760. One of its most famous graduates was Napoleon Bonaparte, who attended the academy in 1784. 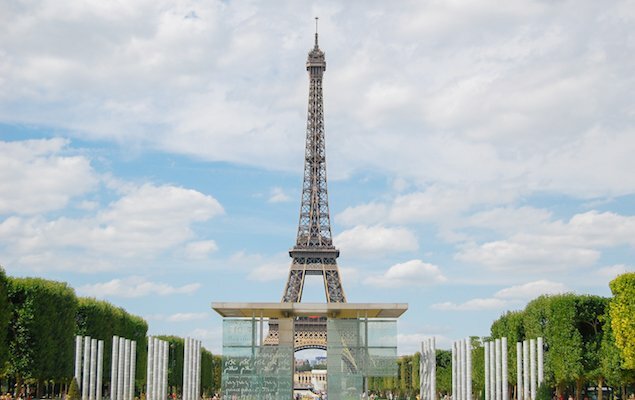 Standing in front of École Militaire on Place Joffre, you have a sweeping view over the Champ de Mars gardens with the heart-stopping Eiffel Tower crowning the end of the Champs. The Champ de Mars was originally used as a military parade ground and training grounds for the students at École Militaire. This far end of the Champ de Mars also houses the Wall for Peace, an art installation where the word “Peace” is inscribed on glass panels in 32 languages and 12 alphabets. Sadly, the monument has been damaged and vandalized in recent years, and its future is uncertain. It is currently fenced off and closed to visitors. Tip: If you’re looking for a grocery store open late, the CarreFour City Market at 42 Ave. de la Motte Picquet is open 7:00am – 11:45 pm Mon-Sat (shorter hours on Sunday). 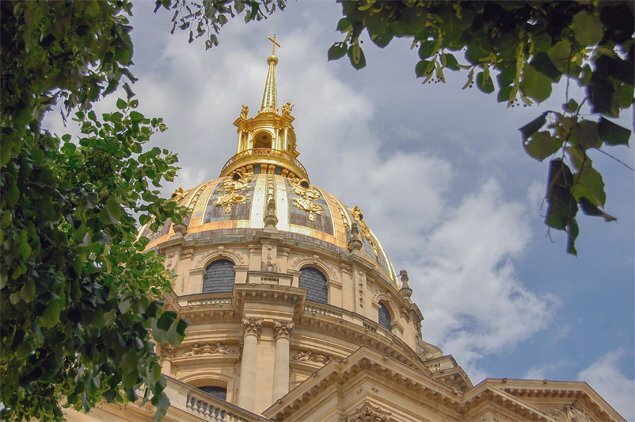 Get off at this stop and you will be just a few blocks south of the main entrance to Hôtel des Invalides, with its beautiful golden dome. Constructed in 1676 at the behest of Louis XIV to serve as a hospital and retirement home for war veterans, the Hôtel des Invalides housed 4,500 veterans at its peak at the end of the 17th century. The aged and wounded veterans had jobs making uniforms, shoes and tapestries. The complex now houses only 100 veterans. The complex contains a chapel and several museums, most notably the Army museum, containing one of the largest collections of military art, memorabilia and history in the world. The Army Museum is a vast collection, with spaces divided chronologically, highlighting artifacts, armor and weaponry from the 12th -20th centuries. The WWI collection alone takes up over 20 rooms, and the WWII collection is even more impressive. 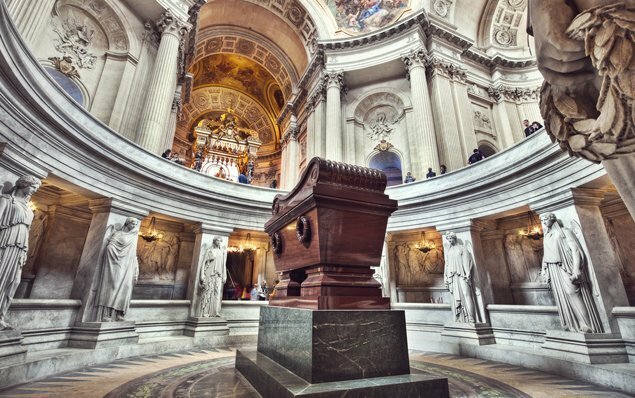 Under the spectacular dome you will find the tomb of Emperor Napoleon, who died in exile in 1821 on the island of St. Helena, but was later brought back to Paris and laid to rest in a custom-designed red quartz tomb in 1861. On the north side of Hôtel des Invalides lies one of the most grand open spaces in Paris, known as the esplanade des Invalides, which forms an axis across the magnificent Pont Alexandre III, and the Grand Palais and Petit Palais beyond. Fans of military history could easily spend half a day exploring the Army Museum and complex. Entrance is included with the Paris Museum Pass. Open every day, 10:00 am – 5:00 pm, with extended hours in peak season. Invalides & Army Museum Website. On Thursdays and Saturdays, take this stop and walk south on Ave de Breteuil about 2 blocks to Ave. Saxe where you’ll find one of our favorite outdoor markets in Paris. The market has the freshest produce, meat, fish, poultry, breads as well as flowers, clothing, shoes, jewelry…you never know what you will find, as vendors change with the season. See our full write up of the market here. Originally constructed in 1683, this Catholic church is dedicated to Saint Francois Xavier, who is the Patron Saint of Missions. Its architectural design is a peculiar mishmash of Baroque and a hint of Neoclassical. 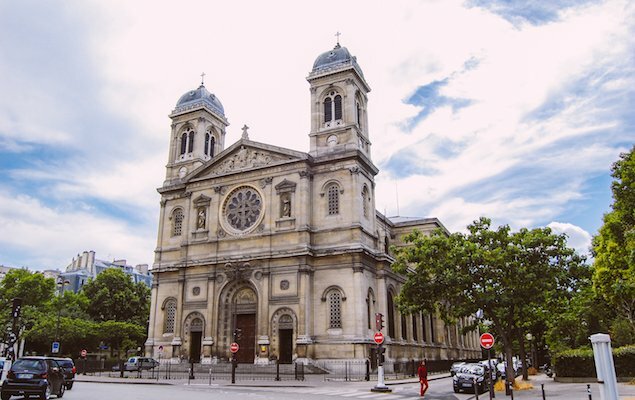 Here’s an interesting historical note: this church operated secretly as the Parish church during the French Revolution, when the area’s actual Parish church, St. Sulpice, was shut down. We’ll be making a stop at Saint Sulpice later on. 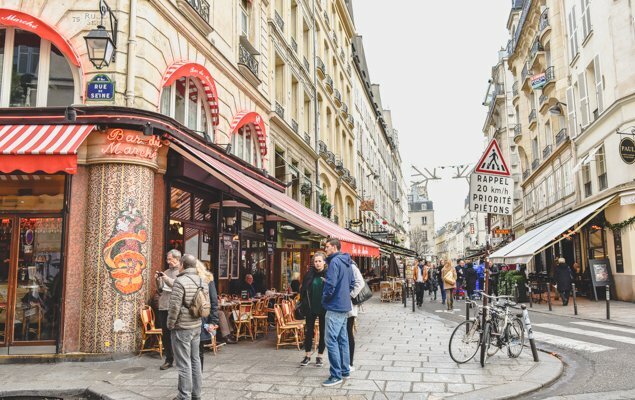 The bus then turns east onto Rue de Sevres and continues several stops as you approach the heart of St. Germain-des-Pres and a wonderland of shops, cafes and boutiques. Hold on to your credit cards and let the shopping commence! 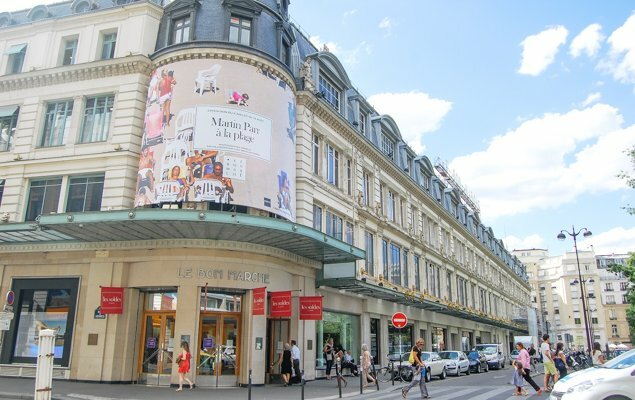 La Grande Épicerie de Paris, Le Bon Marché. Arrive in front of La Grande Épicerie de Paris, a renowned food hall and gourmand’s delight, 3,000 square meters stocked with 30,000 grocery and food items from around the world. Owned by Le Bon Marché, La Grande Épicerie consists of four sections: fresh produce (with fresh fruits, vegetables, meats, seafood and cheeses); groceries (specialty items from around the globe, organized by country); wine cellar (champagne, wine and spirits, including rare vintages); and the production kitchens (fresh pastries, breads, gourmet and delicatessen-style dishes prepared to go). Next door you’ll find the exclusive and expensive Bon Marché, the only department store on Paris’ Left Bank. It’s brimming with designer goods to tempt you, including Chanel, Dior, Louis Vuitton, Gucci, Jimmy Choo and many more. The full-service department store carries ladies fashion and menswear, accessories, lingerie, cosmetics & perfume, children’s clothing & toys, homewares & furniture, shoes, books and gifts – basically anything you’ve ever wanted. From Le Bon Marché you can walk in any direction for several blocks and find shops of every description to tempt you. Walk south down Rue Placide to Rue du Cherche-Midi, window-shopping as you go. For more details about this great shopping area, see our article on the best shopping streets in Paris. Exit here and you have more choices. You can turn south on Blvd. 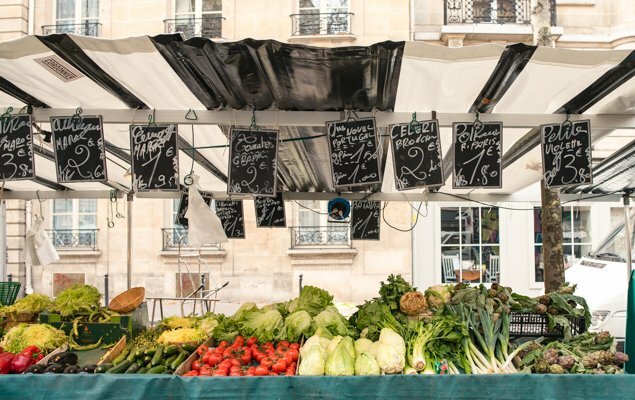 Raspail and continue for one long block to discover the outdoor Marché Raspail, carrying a delicious assortment of fresh produce, meats and seafood, plus a few stalls with clothing and antiques as well. 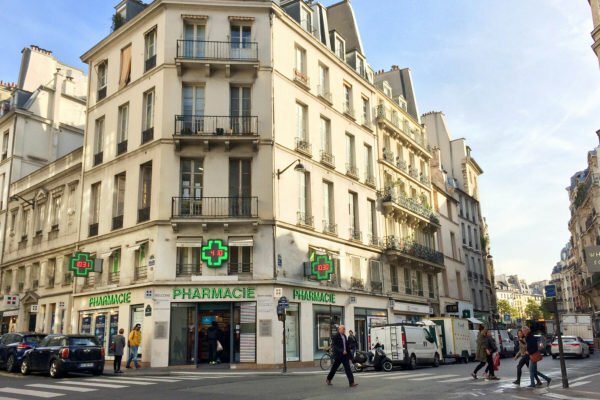 Located between Rue du Cherche-Midi and Rue de Rennes. Operates Tuesday & Friday from 7:00am – 2:30pm. On Sunday, from 9:00am – 3:00 pm, you’ll find the popular Organic market here (Bio in French), with some of the most exclusive organic food items you can find. Or if you continue straight on Rue de Sèvres, crossing over Blvd. Raspail, to 19 Rue de Sèvres, stop in at la Maison du Chocolat and sample the gourmet chocolates and tempting éclairs. You need to sample several, because you will have a little tasting challenge later on at a different éclair shop! Try the chocolat, caramel and mocha eclairs, all in the traditional style. 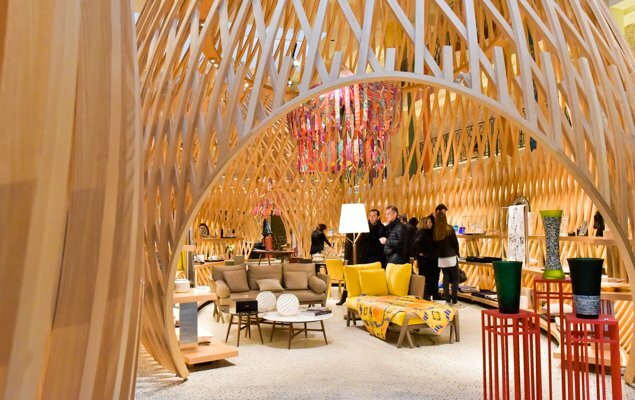 Bring some wet-wipes for your fingers, because your next stop is the flagship Hermès store, at #17 Rue de Sèvres! Walk down into the unique interior that looks somewhat like a bird cage (built over the site of a former indoor swimming pool) to browse through the luxury scarves, handbags, jewelry, clothing and home goods. Are you giddy yet? Hop off here and walk back ½ a block for a closer look at the interesting centaur statue near the intersection of Rue de Sevres, and Rue de Cherche-Midi. Erected in 1988, it’s a modern art installation by noted French sculptor, César. You can continue down Rue du Vieux Colombier, Rue du Cherche-Midi, or Rue des Rennes for more shopping and strolling. As Rue de Sèvres continues eastward it becomes Rue du Four and the next stop is Rue Bonaparte. Get off here, and walk about 2 blocks north, crossing over Blvd. St. Germain to stand in front of the imposing church of St. Germain des Prés. This Benedictine Abbey dates from the 6th century, built by Childebert I in the year 558 to house the relics of Spanish martyr, St. Vincent. It is the burial place of Merovingian kings (the ones Da Vinci Code claims are Jesus’ bloodline). 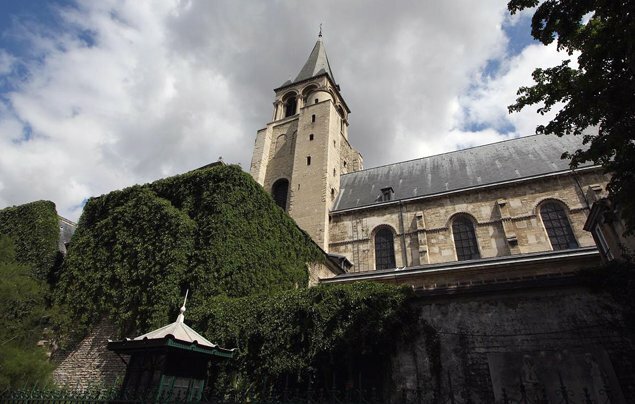 This is the only Romanesque church still standing in Paris, despite having been destroyed by Vikings in the 9th century and rebuilt numerous times, suffering much during French Revolution. Another fun fact: The heart & ashes of the Philosopher René Descartes are buried here. This building represents an incredible 1,500 years of history! In fact, the site of this church pre-dates Notre Dame Cathedral by 600 years! Église St. Germain-des-Prés is still an active parish with daily Masses, concerts and activities. Church of Saint-Germain-des-Près Website – in French. Now turn around and head west on Blvd. St. Germain for just a short 1/2 block and visit one of the two famous literary cafes in the neighborhood. Les Deux Magots, at #6 place St. Germain-des-Prés, has been operating in this location since 1873, and boasts a roster of famous historical patrons including Picasso, Léger and Hemmingway. The café is named for two Chinese figurines that come from a popular play of the 1800’s called Les Deux Magots de la Chine. The two figurines can still be seen watching over the restaurant to this day! 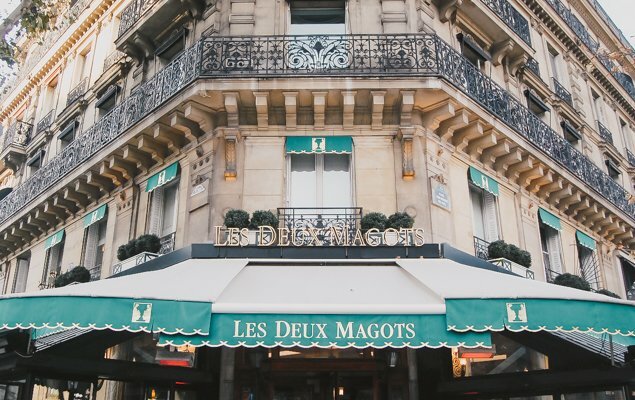 In keeping with the literary tradition, Les Deux Magots hosts an annual literary competition each January called the Prix Deux Magots. Stop in for breakfast, lunch, dinner, coffee or conversation, with great people-watching too. Remember, you’re not paying 7.20€ for the cup of coffee, you’re paying for the table, to linger, chat and people-watch as long as you like. Open daily 7:30am – 1:00 am. 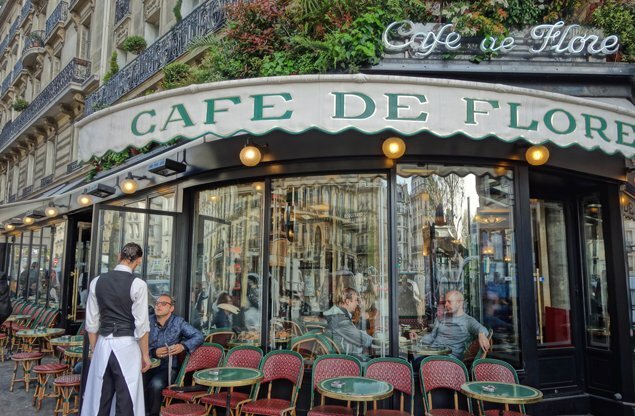 Just across the street in the next block is the equally famous Café de Flore at #17 Blvd St. Germain. Café de Flore claims to be the birthplace of Existentialism, and the café itself has changed very little over the years. Jean Paul Sartre, Simone de Beauvoir, Albert Camus and Pablo Picasso spent endless hours there. The poet Apollinaire, who coined the term Surrealism, lived, worked & died there at age 38 of the Spanish Flu. You must stop here for a hot chocolate. When the waiters, dressed in their traditional black vests and long white aprons, ask if you want your chocolat chaud served with chantilly (pronounced shan-tee-yee) whipped cream, be sure to say “bien sûr!” Touristy, but still a “must do” on your first trip to Paris. Open every day from 7:00 am until 2:00 am. For the carnivores among you, you might want to turn up Rue St. Benoit (the street that runs between Café de Flore and Les Deux Magots) to stop for lunch or dinner of steak frites at Le Relais de l’Entrecote. This neighborhood bistro serves one thing only: sirloin steak sliced thin, with green peppercorn sauce and hot, crispy fries. You’ll receive a green salad as a starter, and the only things you’ll need to decide are how you want your steak cooked and if you want red or white wine. You do also get a choice of desserts! The family has been serving at 4 locations around Paris since 1959, so they must be doing something right! Open every day for lunch – 12:00am – 2:30 pm, and dinner 7:00pm – 11:30pm. They don’t take reservations so queue up outside or get there early just before opening times. The bus continues on Rue du Four and then turns right on Blvd. St. Germain. 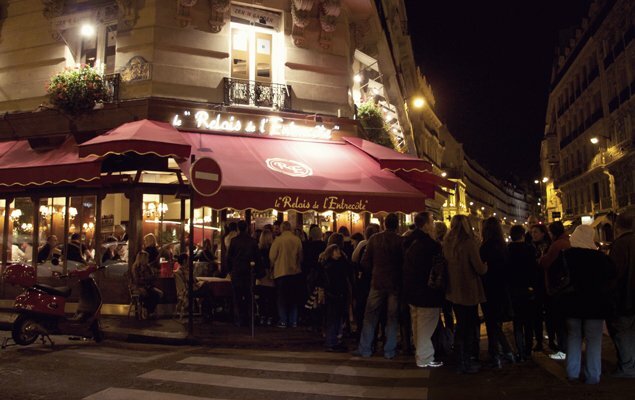 The Charming Rue de Buci! Wow! So much to see in these 5 or 6 blocks north of Blvd. St. Germain. Walk north up Rue de Seine and turn right on Rue de Buci to visit the charming market street with vendors tempting you with their array of fresh products (Tues-Sun). This is the quintessential Parisian neighborhood of your dreams, with cobblestone streets, bistros, boulangeries, butchers, brasseries and much more. A little touristy, yes, but great for people-watching and good café scene at night. You can also continue up Rue de Seine into the next block to visit Kusmi Tea at #56. Pick up an assortment of gourmet teas for yourself or a thoughtful gift. At #54, you will find Semilla, popular contemporary French bistro getting great reviews, and they serve ½ portions as well, so you can try more and share with your friends. Open for lunch and dinner daily. Average price 29-45€. Reservations recommended. The same owners run Cosi, a sandwich shop next door. The next three streets to the east of Rue de Seine are all worth a wander. At #11, Rue Gregoire de Tours, you’ll find Little Breizh café, who serve delicious buckwheat crêpes in both sweet and savory. Crêpes are from the Normandy/Brittany apple-growing regions of France, so be sure to wash your crêpe down with the cold, hard cider. On Rue de l’Ancienne Comedie is the oldest café in Paris Le Procope at #13. It dates from 1686, and was frequented by French literary giants (Voltaire, Hugo) and political figures including Thomas Jefferson and Benjamin Franklin. Open daily. 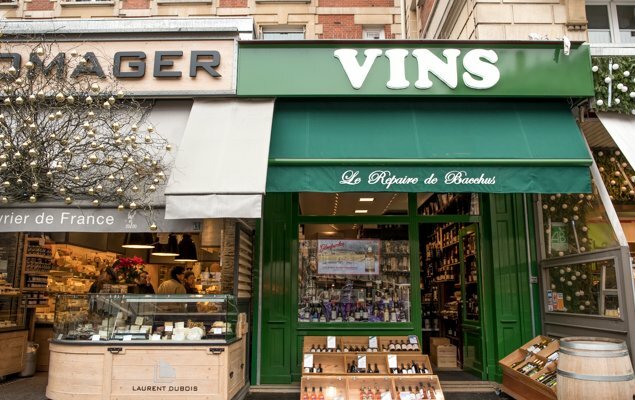 Don’t forget the beloved boulangerie Eric Kayser at #10 on the same street. L’Éclair de Genie is at #13 if you’re on an éclair tasting challenge. The éclairs here are extremely unique, with uncommon flavor pairings that change with the seasons. See our blog post here. Cours du Commerce Saint-André is another charming pedestrian, cobblestoned street leading to a covered passage of shops. Check out Un Dimanche à Paris café at #4-6 for lunch, brunch or pastries, and grab a decadent, old-fashioned hot chocolate at the rustic La Jacobine in the same passage. This is another great stop for shopping and people-watching. Coffee addicts can get their fix at Starbucks at 91 Blvd. St. Germain. You may notice an outdoor candy stall at the entrance to the metro. Rumor has it the vendors cook skewers of rock sugar under the counter so you are hit with the sweet scent the minute you ascend from the metro station. Head northeast on Rue Danton about 5 minutes towards the river and you’ll find yourself in Place St. Michel, the busy public square that forms the boundary between the 6th and 5th arrondissements. 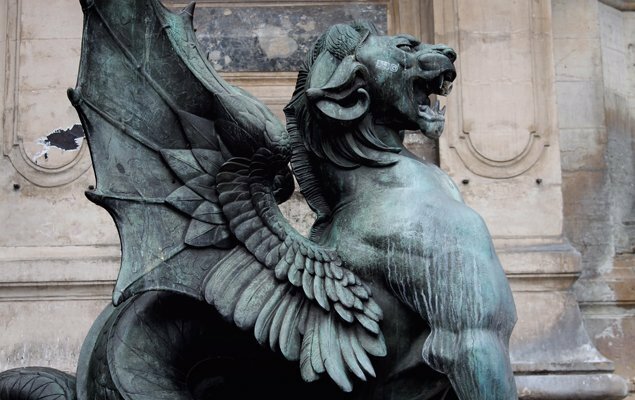 Admire the fountain of St. Michael the Archangel with its twin water-spouting dragons, sitting under the watchful eyes of the four cardinal virtues: Courage, Prudence, Temperance, Justice. 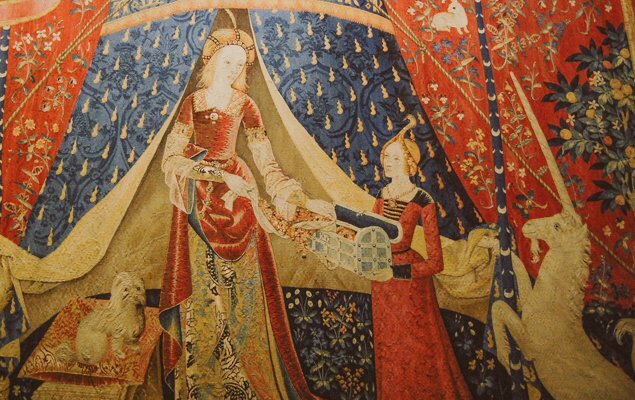 One our favorite small museums, a hidden gem, and one of the most overlooked, the Cluny Museum of the Middle Ages was built between 1485 and 1510 on top of the ruins of an ancient Roman bath, and is one of the most beautiful buildings of medieval Paris. Famous for the exquisite medieval “The Lady and the Unicorn” tapestry series, the five panels depict many features of the Middle Ages – a lovely and noble lady, an entranced unicorn, house pets and an allegory of the five senses; sight, smell, hearing, touch, and taste. Especially interesting are the stained glass windows from St. Chapelle (which you can examine very close-up), and the stone heads of the biblical kings of Judah, pillaged from main façade of Notre Dame Cathedral. The heads were “chopped off” in rebellion during the French Revolution, being mistaken as kings of France, and were just re-discovered in 1977 during construction of a bank at 20 rue de la Chaussée-d’Antin, near the Opéra Garnier. This museum is highly interesting and well worth an hour of your time. Closed Tuesdays. The entrance is on the south side of the building so you’ll need to walk around. Stop in for dinner, or snacks and an apéro (French happy hour) at a cute tiny wine bar, Le Porte Pot at #14 Rue Boutebrie, on the north side of the Cluny. Open Tues-Sat from 6:00 pm. Walk about 3 blocks north on Rue de Petit Point, turn left on Rue de la Huchette and notice #5, the Caveau de la Huchette. This small renowned Jazz club (in the cave below) is your neighborhood hot spot for live Jazz, Swing, Big Band music and dancing the night away, so be sure to bring your dancing shoes! Cover charge approximately 15 Euro but that includes the live music. It’s built on a site dating from the1500’s and was a former prison and lodge of the Knights Templar. A very special treat for your evening wanderings. 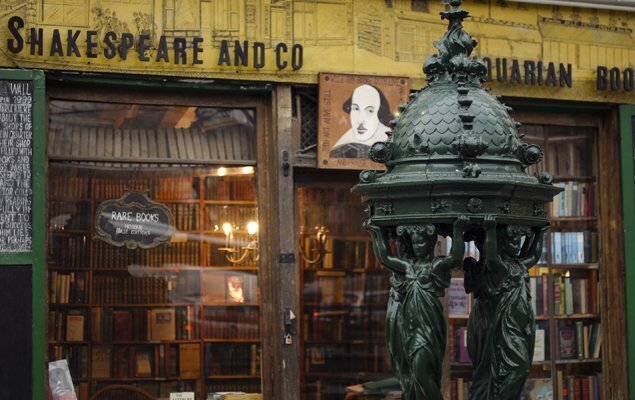 From Rue de Petit Point, turn right on Rue de la Bucherie and walk to #37 to visit the illustrious Shakespeare & Company English-language bookstore. Established in 1951 by American George Whitman (read his fascinating history here) as a sanctuary for writers, poets and artists, it’s a Paris institution, so be sure to stop in and browse. Open daily, 10:00am-11:00pm. They opened a café in late 2015, where they serve healthy snacks and excellent coffee – a view of Notre Dame across the river is included! Now continue on #87 for 3 more stops to the tip of the Ile St. Louis in the middle of the Seine. Step off here to explore the charming Ile Saint-Louis, only 3 blocks wide, with a charming pedestrian feel. Berthillon at 31 Rue Saint-Louis is famous for their ice cream. Open Wed-Sun, 10:00am – 8:00 pm. Don’t worry, if their flagship store is closed, plenty of other retailers sell the same flavorful ice-cream nearby. Why not meander over to the tip of the island, Square Barye, and watch the river traffic as you enjoy your sweet treat. Crossing over to the Right Bank, travel on 3 more stops on the #87 bus and you’ll find yourself in the heart of Place Bastille. This busy roundabout held an incredible role in the French Revolution. On July 14, 1789, angry citizens stormed the prison and began the chain of events which overturned the French monarchy. 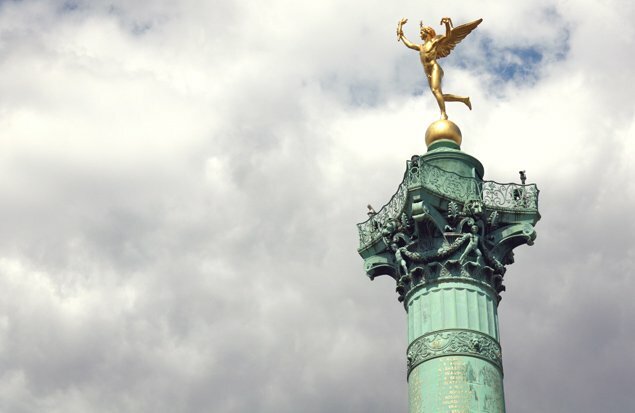 Today you’ll find a soaring column in the center, topped with a golden genie that represents liberté. 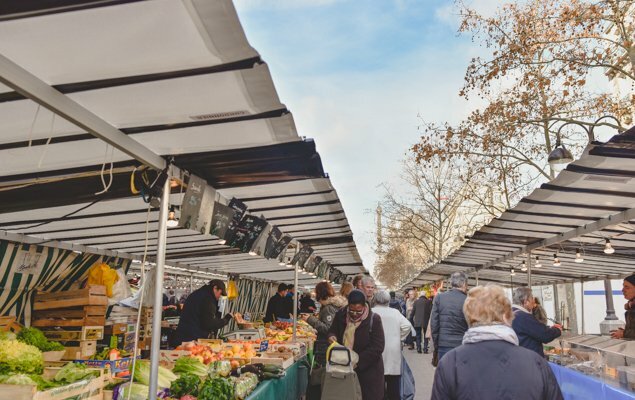 On Thursday and Sunday mornings, travel north from the Place Bastille on Ave Richard Lenoir to visit one of the largest and most popular open air markets in Paris, Marché Bastille. With over 100 stalls, vendors spread their wares of produce, poultry, fish, cheeses, olives, spices, etc. as well as inexpensive clothing, jewelry, shoes and more. Vendors are in place from about 7:00 am – 2:00 pm. On most Saturdays, however, you’ll find and arts and crafts market here. On the west side of Place Bastille you can begin a walk to Places des Vosges and then deep into the popular Marais district. Find the Place des Vosges by walking west along Rue St. Antoine from Bastille and turning right on Rue de Birague. 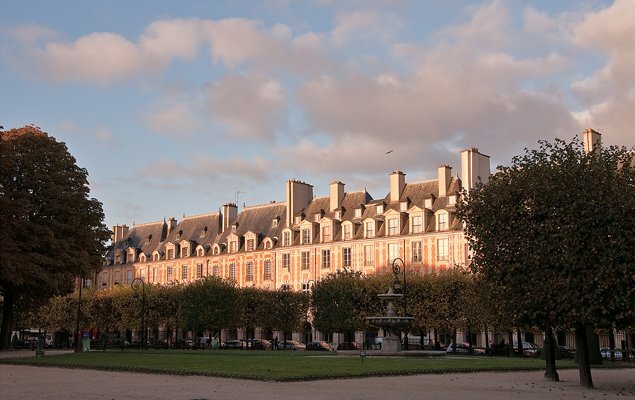 The Place des Vosges is a beautiful square built by Henry IV in 1605. 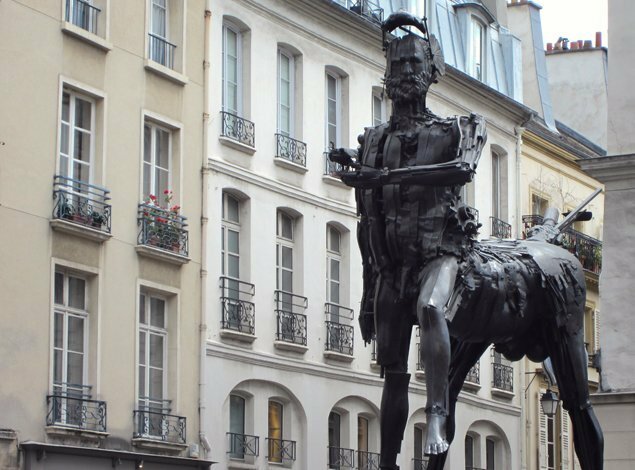 The center boasts a statue of Louis XII on horseback, promoting the utmost wealth and high society that the Marais once held. If you don’t choose either of these options, you could stay on the bus another 3 stops to arrive at the busy Gare de Lyon, which is the rail gateway to the fabulous southeast regions of France (Lyon, Avignon, Provence, Cote d’Azur). The #87 bus continues beyond Gare de Lyon to Gare de Bercy and another 5 stops to the southeast ring road of Paris, but there is not much of interest to tourists quite this far out. So if you are not going to Gare de Lyon, we suggest you begin your return journey back to the left bank by crossing over to the west side of the Place Bastille roundabout (near Rue St. Antoine), to pick up the #87 bus going in the opposite direction (Direction: Champs de Mars). Four stops after leaving Bastille, you will arrive at the Institut du Monde Arabe, a unique contemporary building designed by renowned French architect, Jean Nouvel, dedicated to the history and culture of the Arab world. 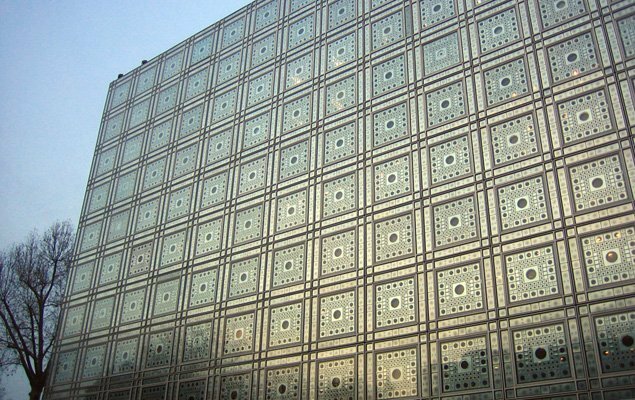 The Institute represents a partnership between France and 18 Arab countries, and highlights literature, art, dance, technology and more. Check out the terrace on the 9th floor with a view over the Seine and Notre Dame. Its a spectacular vantage point, one that’s quite unknown. Open Tues-Sun, 10:00am – 8:00pm. 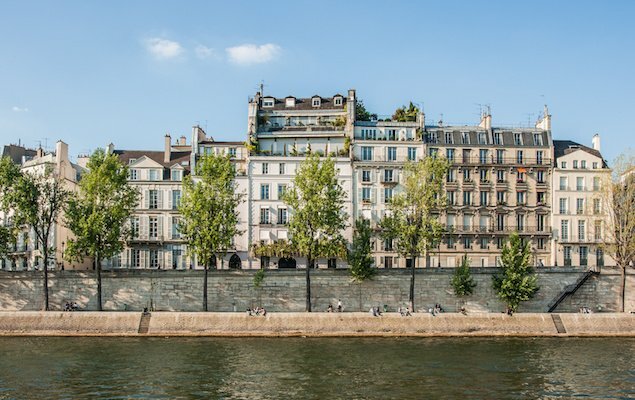 Just southeast of the Institut du Monde Arabe, you will find the expansive Jardin des Plantes, a botanical garden complex established in 1635 by Louis XIII’s personal physician as a medicinal herb garden. Expanded over the years, the Jardin des Plantes forms the heart of the National Museum of Natural History, the Galeries of Paleontology & Evolution and a Menagerie (zoo). The garden contains over 10,000 species of plants and herbs, a lovely Rose garden, Alpine garden and more. Restaurant on site, La Baleine, with whale/nautical theme. Open daily, 8:00am – 5:30pm, later in peak season. Le Terroir Parisian – three star Michelin chef Yannick Alleno operates this modern and popular bistro, at #20 Rue Saint-Victor offering fixed menus at affordable prices of 28-32€, and receives great reviews. Open every day for lunch and dinner. Email or call for reservations, website linked above. Continue on the #87, passing through the heart of the Sorbonne (Stop: College de France), and revisiting some of the same stops as the west to east route (Cluny, Odeon). Image by Fr Lawrence Lew. 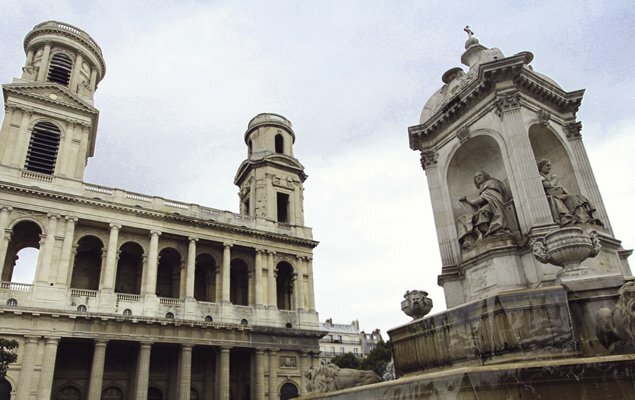 The imposing church of St. Sulpice, named for a pious saint who resisted tyranny of Merovingian kings. The current structure was built in 1646 on the site of a former Romanesque church from the 13th century. Here Victor Hugo was married, and the Marquis de Sade and Baudelaire were baptized. Famous for Delacroix frescoes in the Chapel of Angels (first side chapel on the right when you enter,) and one of the world’s largest and most impressive pipe organs, with scheduled organ concerts. You can hear the organ before and during Sunday masses at 11:00 am and 6:45 pm, and also for 30 minutes each Sunday beginning at noon. The church is featured prominently in the book and movie, Da Vinci Code. Leave St. Sulpice and walk south on Rue Ferou or Rue Bonaparte to visit beautiful Luxembourg Gardens, where all of Paris comes to play. Luxembourg Palace forms the north end of the gardens, currently the site of the French Senate. The formal gardens were commissioned by Marie de Medici, widow of Henry IV, in 1612 and designed to resemble her childhood home in Florence. Enjoy the Medici Fountains, the ornamental gates, grassy spaces, orchards and statuary, with plenty of seating to enjoy a picnic and watch the world go by. This is a great place to take a break from sightseeing and watch children sail toy boats on the large pond. Also for children: playground, puppet theater and pony rides, in season. Open daily until dusk. 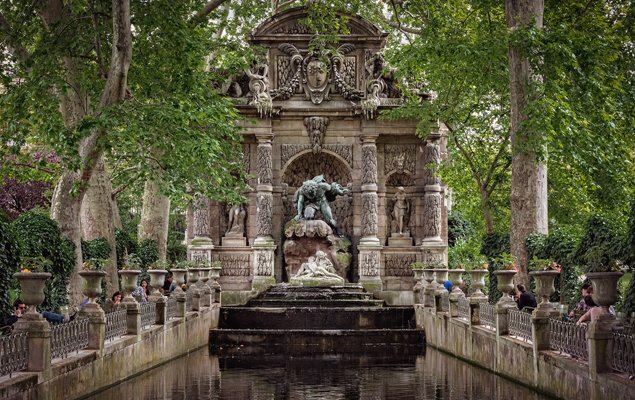 The Medici Fountain at the Luxembourg Gardens. Image by David Nicholls. The #87 bus continues towards Sevrès-Babylone area, turning west on Rue de Babylone and head back into the 7th arrondissement. The 4th stop after St. Sulpice is Vaneau Babylone. 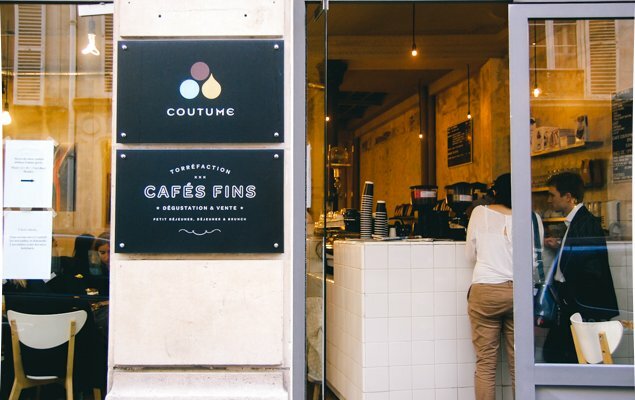 Coutume Café, at 47 Rue Babylone, is a busy and popular café, beloved for having some of the best coffee in Paris. Coffees are carefully sourced from the most popular growing regions in Africa, custom-roasted and available to enjoy brewed by the cup, or for purchase in whole beans or ground. Costume also serves breakfast and lunch. Open Mon-Fri 8:00am – 6:00 pm, from 10:00am on Sat & Sun. (closed half of August). And in another 4 stops, you are back at Rapp-Bourdonnais where the route began! Phew, that was a journey! We hope you thoroughly enjoyed this tour of the 87 bus line. Buses and the Metro in Paris use the same tickets. You can purchase individual tickets onboard from the driver with cash, and you can also ask for a carnet, a 10-pack of tickets offering a small discount. Validate your ticket by inserting it in the machine behind the driver and take your ticket back in case you want to hop off and back on again later. Tickets are good for 90 minutes in either direction. When you want to return, you need to use a new ticket for the opposite direction. So tell us what you think of the #87 bus line. Have we missed any of your favorite spots? Tell us in the comments below or over on our Facebook, Twitter and Instagram pages! Posted on Thursday, January 28th, 2016 at 6:39 pm in Parisian Living. You can follow any responses to this entry through the RSS 2.0 feed. You can leave a response, or trackback from your own site. Thank you for a super article! I have been to Paris many times but never travelled on a local bus…now I havethis information, I most definitely will! 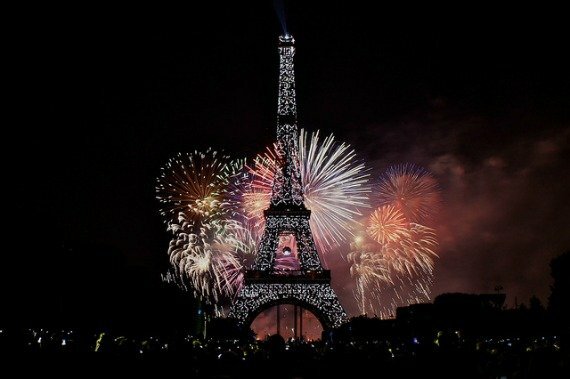 Heading for Paris in September, so a bus trip will definitely be on my list of things to do.